At Murray’s, we have three main principles that guide our pairings: Opposites Attract, Like with Like, and What Grows Together Goes Together. The first two are strictly about flavor and texture principles: if things tastes similarly (like a butterscotchy Gouda with actual butterscotch), or quite differently (say, fatty foie gras pate with zingy dried orange slices), they’ll most likely work together. When it comes to Cider and Cheese pairings, however, we like to look towards the third principle, which centers around Terroir. When we say, “What Grows Together Goes Together”, we’re talking about pairing two products from the same geographic area. 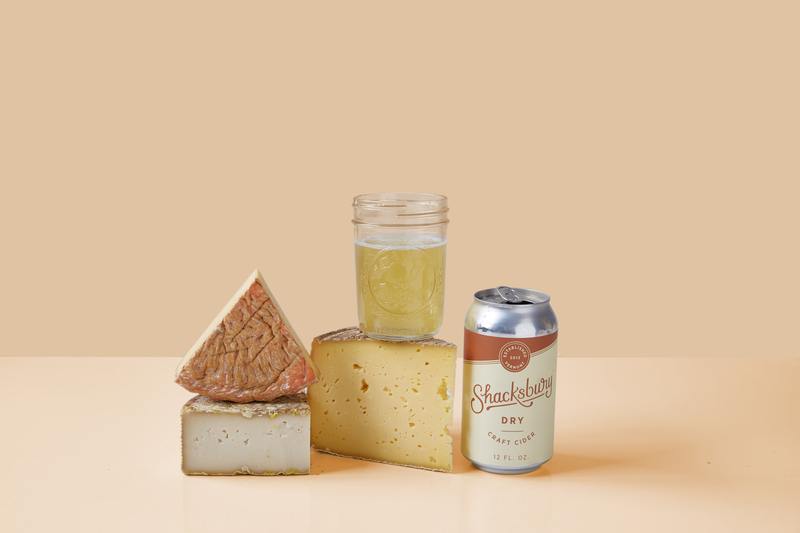 These pairings work because, whether it’s cheese, cider, or jam, all the products are in some way a reflection of the land they come from. For cheese, this means the milk will taste a certain way, and result in a certain flavor in the cheese, because the cow’s are eating a unique mixture of flowers, herbs, and grasses grown only in the area they live. Cider’s connection to the land is a little more straightforward — unique characteristics in the cider are directly contributed by the climate, soils and aspect of the orchard in which its apples were grown. 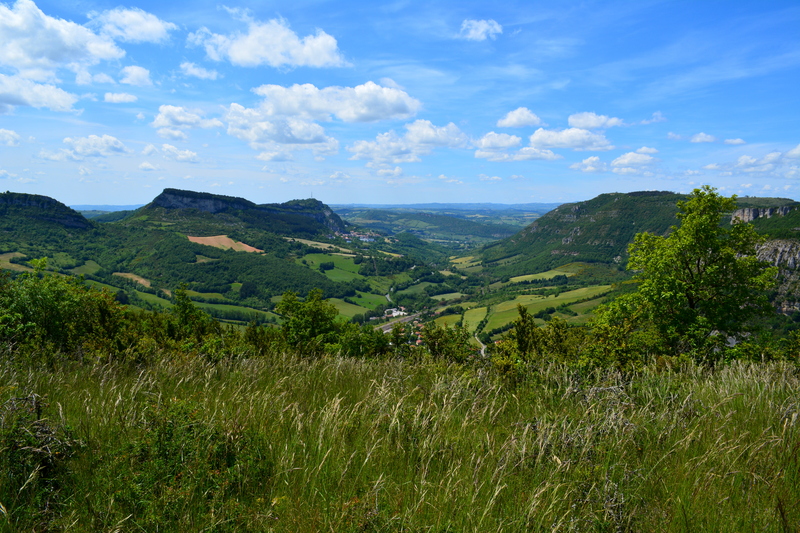 Terroir, or the taste of place, is a great basis for pairing! With both products such results of the land they came from, it makes sense that they taste great together. 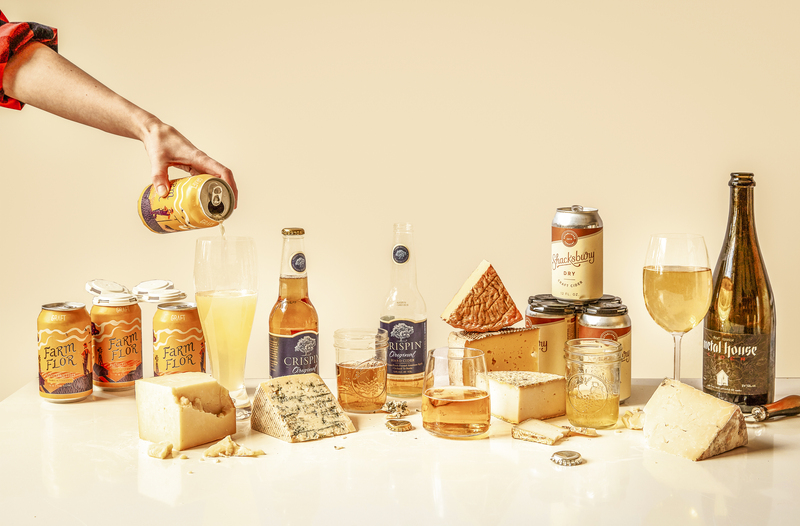 We’ve put together some of our favorite terroir-based Cider and Cheese pairings below, along with their state of origin, take a look! We like to think of Shacksbury Dry as the antidote to anyone who says they “don’t like cider”. We liken it to English-style Cider: bone dry, lightly effervescent, and full of tart, slightly salty flavor. This can from the venerable Vermont cider makers shows off everything cider can be. We think it pairs quite nicely with a few of our favorites from another great Vermont producer: Consider Bardwell Farm. We especially like it with Pawlet, which has mushroomy, meaty flavors that are cut beautifully by the tart, slightly acidic cider. Try these two for a taste of the Green Mountain State, no flannels or “Bernie 2020” stickers required. 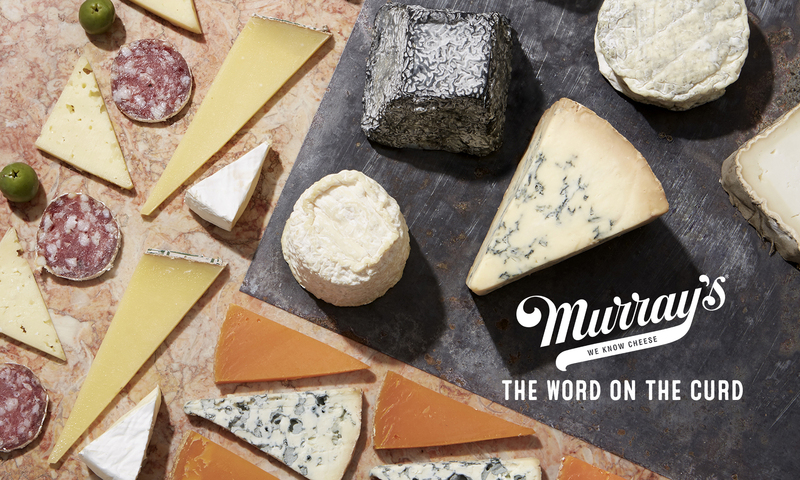 We here at Murray’s have a soft spot for products made in New York, because as much as we love championing the latest washed rind cheese from a small town in France, we equally enjoy turning people on to great food that comes from their (relative) neighbors. 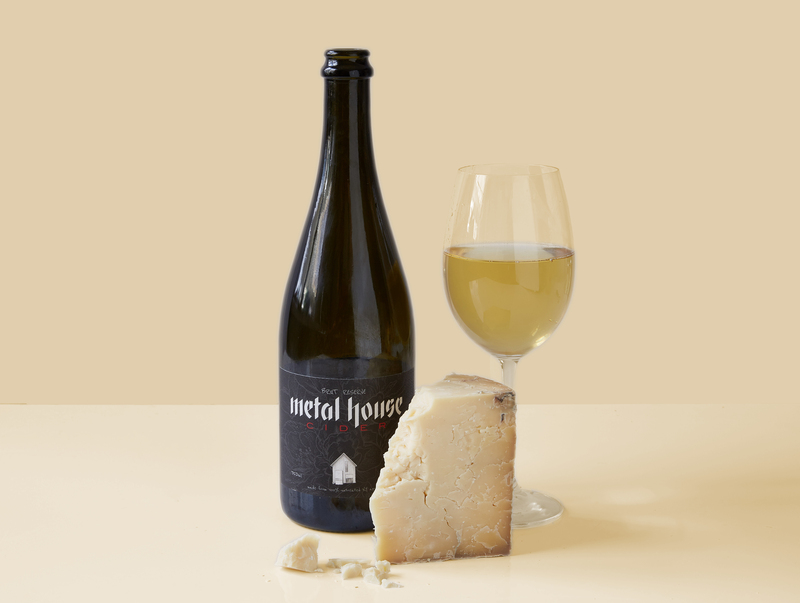 Take Metal House Cider, for instance. Located in the Hudson Valley, this cidery makes their juice from 100% untreated Hudson Valley apples. This means that sipping their cider gives you a true taste of the lush New York countryside, untouched and wild in all the most delicious ways. And speaking of delicious, made in New York products, we like to pair this big bottle with a big, crumbly and fudgy wedge of our own Cavemaster Reserve Stockinghall Cheddar. Every step of our make process with this cheese, from milking the cows to aging the cheeses in our very own Long Island City caves, is done in New York. A perfect New York Cheese for a perfect New York Cider. When you think of California, what comes to mind? We’re guessing award winning blue cheese and naturally fermented cider are not your first thoughts (if they are, you should come work for us). However, California is one of the great Cheesemaking states, and Bay Blue, from Point Reyes in Northern California, is a great American cheese. Sweet and mellow earthy notes come from the various grasses and flowers Point Reyes’ happy herd munch on, and a fudgy texture makes this a blue that’s easy to love. 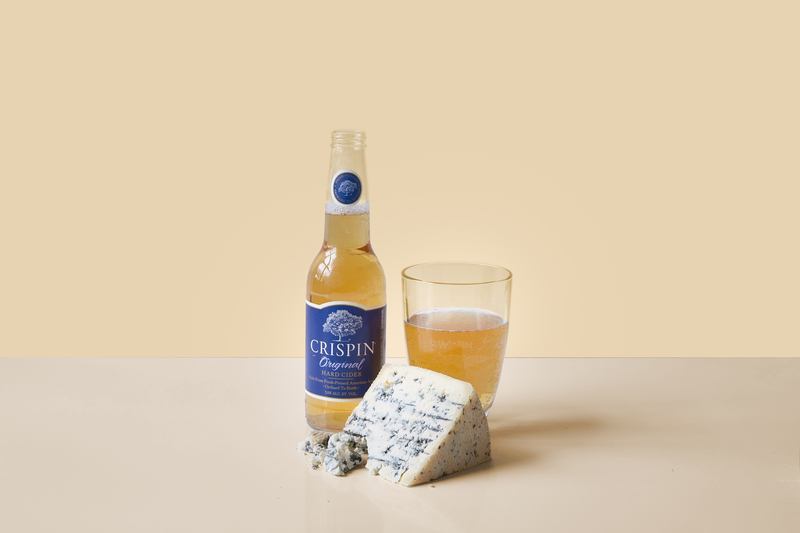 Pair it with an Original Crispin cider, with flavors of crisp clean apple, and a hint of lemongrass. Taste these two while quietly signing “California Dreaming” to yourself, and before you know it, you’ll have an agent and basically know how to surf.